Perhaps the question should be “Why do dogs want to eat chocolate?” The primary reason is that many dogs want to eat anything people eat. The secondary reason is that chocolate, in its edible forms, is usually sweet – and dogs like sweet foods. Depending on the amount, any food has the potential to be lethal to dogs and humans, but dogs have a much lower threshold for the compound contained in chocolate, theobromine. People can metabolize theobromine easily which is why we don’t overdose after eating three bars of chocolate. Dogs metabolize the compound very slowly which causes a build-up in their body. Milk chocolate contains far less theobromine than dark chocolate or pure baking chocolate, but it can still cause mild to severe sickness in dogs. Additionally, milk chocolate would probably be more appetizing to the canine palate, leading to a doggy binge if they happen to get their paws on it. Still, only a small square of baker’s chocolate is needed to poison a dog. The form of chocolate that is the worst culprit is Dutch cocoa which is almost pure chocolate in powder form. Because Dutch cocoa is also easy for a dog to ingest, this food is the deadliest form of chocolate for dogs. Theobromine is not the only concern in chocolate. The rich substance contains high levels of caffeine which is also unhealthy for dogs. Similarly, coffee should be kept out of paw’s reach too, although coffee is not as appealing to dogs as chocolate. 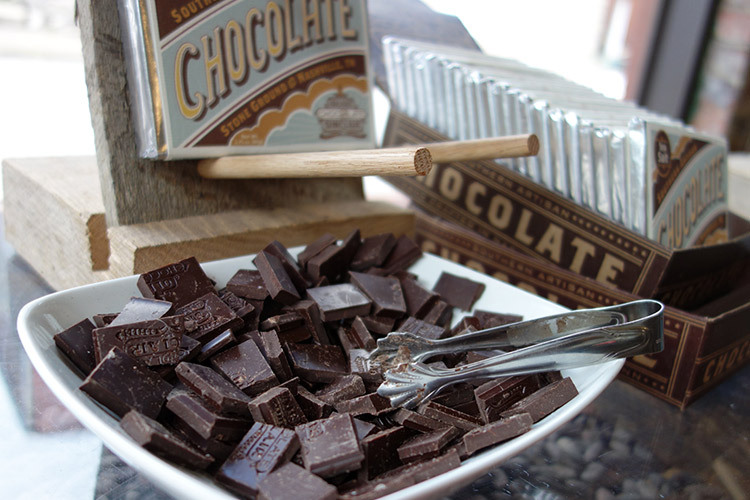 People would use “death by chocolate” to emphasize their love of the treat. With dogs, this is a reality. While a tiny milk chocolate nib may not do any damage, it’s best to keep this doggy contraband out of their reach altogether. If you come home to see bags of Hershey’s Kisses shredded open with their contents ripped asunder, you will need to induce vomiting immediately by sticking your fingers down your dog’s throat. Then, contact your emergency vet for speedy treatment. Symptoms can range from mild to severe. Mild symptoms include lethargy and diarrhea. Severe symptoms include seizures, arrhythmia, and internal bleeding. Keep in mind that a small dog will need treatment immediately after eating chocolate in any dosage – a tiny amount can be fatal. Because it isn’t easy to tell when your dog has gotten into the forbidden foods or how much he has eaten, try to lock away such consumables in an impenetrable container or area. If you get gourmet dog goodies, you may be confused to see that some appear suspiciously chocolatey. Don’t worry – they aren’t made with chocolate. These treats are probably either made to appear to look chocolatey for your benefit (we want to give our dogs aesthetically pleasing food too) or they may contain carob. Carob bean, a miraculous legume, is used because it looks and tastes like chocolate – without the fat and calories. It, like many legumes, can be used in dog foods. A plant from the pea family, the carob bean has no caffeine and a negligible amount of theobromine. Most importantly, our dogs love it! If your dog has a major sweet tooth, give him bananas and super-ripe mangoes mashed up with peanut butter. Apple sauce or baby food of the fruit variety is a good option too. Stay away from sweeteners such as sugar, agave, maple, and honey. If you must use a sweetener, opt for the more nutritionally dense blackstrap molasses. A little creativity and ingenuity with common human foods will go a long way in preventing your dog from feeling as if he is missing out on dessert! Leaps & Bones: Let Them Eat Carob! What Do Hermit Crabs Eat?